Artificial intelligence, or AI as it’s commonly known, has rapidly become the “topic du jour” for B2B companies around the world. Most see the obvious potential, but the widespread perception is that AI is only available for enterprise organizations with massive budgets, large IT teams and extensive resources. 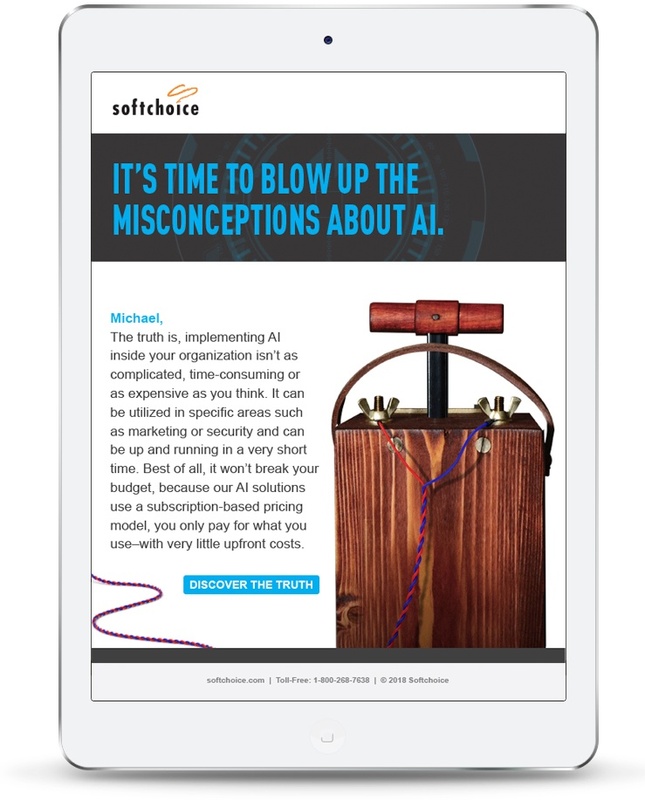 Softchoice wanted to break that perception and show that getting started with AI is easier than most people think. They wanted to show that companies of every size could “start small,” focus on certain areas (such as security), and make a significant impact—with a smaller budget and fewer resources than you’d expect. 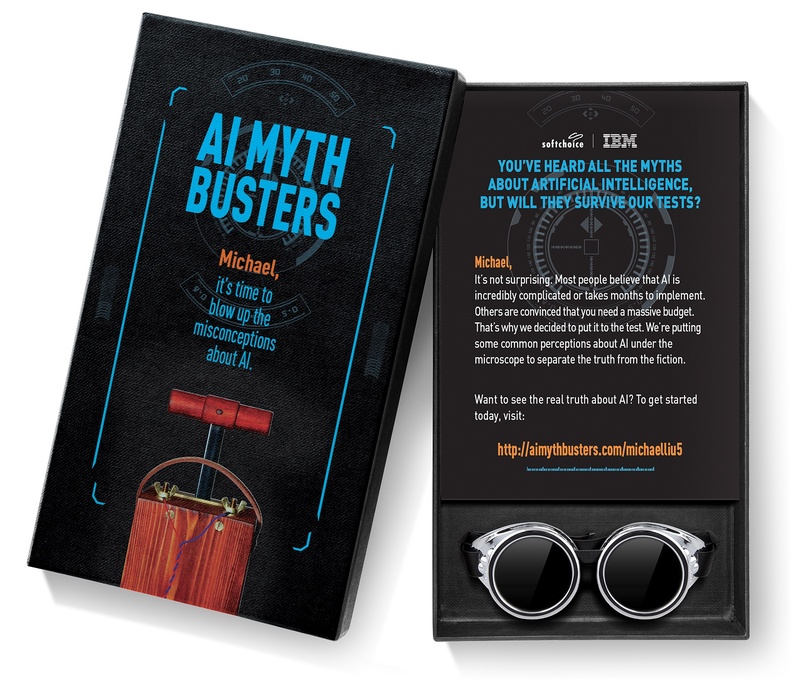 To accomplish this, we created a high-impact direct mailer that was designed to blow up the myths around AI. Inside the box, we also included a fun giveaway item to help extend the messaging around the campaign and a call to action to visit a personalized website. 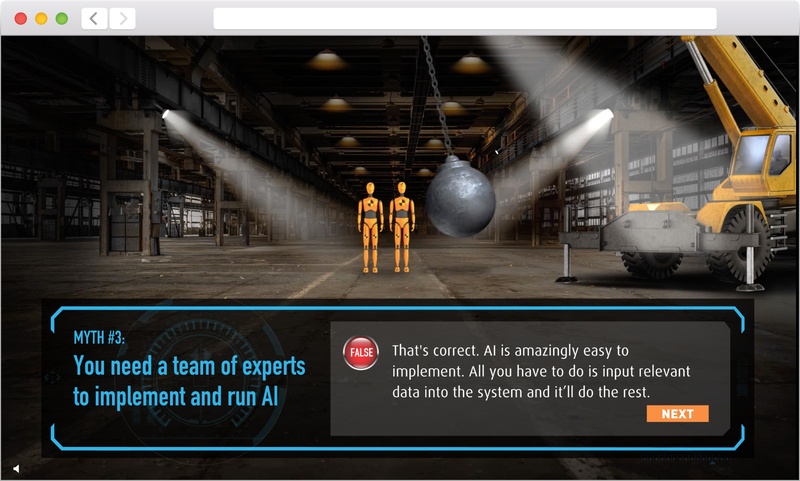 Targeted prospects were also sent emails that challenged them to blow up the misconceptions about AI with the call to action of “Discover the Truth”. Each email was designed to drive the recipient to visit a personalized digital destination to learn more. Once the direct mail and email recipients arrived at their personalized digital destination, they took a fun quiz asking them about their perceptions about AI—and we made sure to set them straight with the truth. They could also select from three key business areas—security, marketing and analytics—and download selected content that discussed how AI could be utilized in these specific use cases. If interested, recipients could also schedule 30-minute calls with Softchoice to learn more. View the digital experience.